Even those of us enjoying a grain-free and low-carb lifestyle have a hankering for a classic treat from time to time! The trick is to minimize the damaging ingredients (such as grains and sugar) and maximize the flavors. 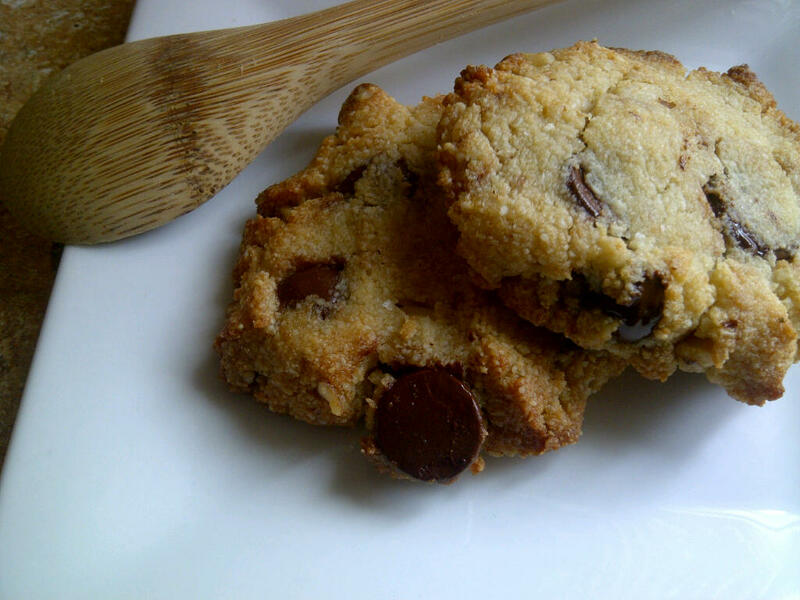 Almond flour is a natural fit for this recipe, as the nuttiness matches well to the dark chocolate. To keep the carbs low, be sure to get chips with as high of a cocoa content as possible, aiming for 85% (you may even want to buy a dark chocolate bar and break into small pieces.) As many of us also have children and teens in the house (not to mention husbands!) it’s helpful to be able to provide “sweets” that make them feel a little more normal, while knowing that we are supporting good health at the same time! I adapted this from a recipe from the extremely talented Elana, and you can find it here on her blog. The changes I made were to switch away from grapeseed oil, as it’s not compliant with the Wheat Belly eating plan, and to switch out the agave syrup as well, for the same reason. Hope you enjoy these as much as we do! Preheat oven to 350. In a large bowl, mix together dry ingredients. In a medium bowl, mix together wet ingredients. If you are using butter and/or coconut oil, be sure they are melted into liquid form. Place in flattened circles on a parchment-lined sheet, using about 1 Tb per cookie. Bake for about 7 minutes, or until the edges are browned. The original recipe suggests 7-10 min, but they get dark very quickly, so do keep an eye on them. Remove whole sheet of parchment to a wire rack to cool, or set the entire pan in a safe place to cool. If the cookies are moved before they cool 10-15 minutes, they will crumble and fall apart. They firm up as they cool though. Makes 18 cookies. 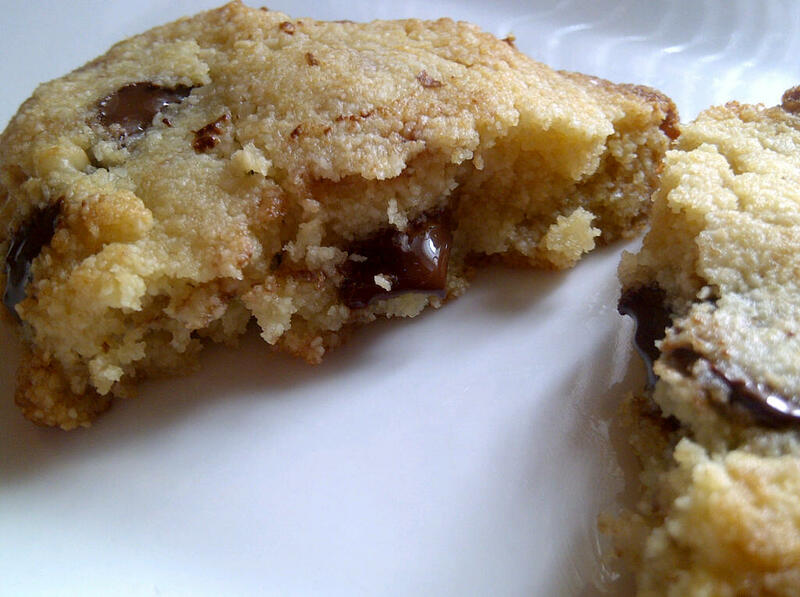 Note: Made with 60% cocoa Ghirardelli chocolate chips, there are about 4.4 net carbs per cookie. If you use a higher cocoa chocolate chip, you can get that number even lower. ***Adding an egg is optional, if you would like. It does help the cookie hold together a little easier, but I think it makes it a little softer. Great either way! I’ve never used erythritol before. Would you suggest the same amount of sugar as a substitute? I think the same amount of sugar would work, yes. We use erythritol and other sugar substitutes to avoid spikes in blood sugar and remain low carb. I would use coconut sugar or palm sugar. Both are around 35 on the glycemic index. Palm sugar tastes a lot like brown sugar. Can I use Splenda brown sugar blend? I would think that you could. I get headaches from Splenda, so I don’t use it personally. I tweaked this recipe to get the carbs as low as possible, so just use your own judgment as to how many carbs are acceptable for your diet, and how many are added by the Splenda (if any.) The amt of erythritol that I used is comparable to sugar, so if you sub, keep that in mind. Good luck! What is th e calories in an average cookie? Hi Barb, I don’t know what the caloric content is for the cookies, or for anything else I post, as I do not count calories, EVER. I follow the Wheat Belly plan of eating, which is eliminating grains and following a low carb diet. Counting calories is based on the supposition that all calories are created equally, and that calories in being less than calories out is what determines weight loss. There have been studies done that show that it isn’t the calories, but rather the type of calories (i.e. carbs from sugars) which create fat gain. My diet is based on very low carb foods, veggies, some fruit, meats, fish, cheese, nuts and healthy oils and fats, which prevents the body from having blood sugar spikes and releasing insulin (which is basically the fat storage hormone.) If you are counting calories and/or fats, cookies made from nuts are probably not a great choice for maintaining your diet plan. I really think most sweeteners would work, you just need to be familiar with the ratios. I like erythritol because I notice less of an aftertaste. If you try it, please let me know how it turns out so I can pass it along to others! True about the bulk, and I also think that Stevia is so intense that the sweetness can linger and also overpower more subtle flavors. Some people seem to enjoy baking with it though, so if it works, have at it! As for Xylitol, I wasn’t aware that it could actually lower blood sugar, but I can’t bring myself to use it on the off chance that my dog might swipe a cookie. Good advice for people who don’t have pets though! The carb count is going to depend on what chocolate chips you use, and how much. There are about 30 net carbs from the almond flour, and if you used only 60% cocoa (Ghirardelli) chips, there would be another 50 carbs, for a total of 80 for the batch… I was able to get 18 nice-sized cookies, so the carb count would be about 4.4 per cookie. You can get that lower by reducing the amount of chocolate or by using chips with a higher cocoa content. Awesome! I have really missed cookies and this did the trick. I did not have erythritol on hand so I used xylitol, but 1/2 of what you suggested and they are great. I no longer need things quite so sweet. Just curious, why the 1/2 butter and 1/2 coconut oil? I think I would use all butter next time — and there will be a next time on these! Hi Susie, so glad you enjoyed these! The reason that I included coconut oil is that it has health benefits, especially in a low carb diet, and I am trying to up my daily intake. I also wanted some butter in there for the buttery flavor 🙂 You could certainly use all butter, I have made them that way as well. wow these were really terrific-even my husband enjoyed them!! the flavor really captured that of a grain flour-based cookie-certainly a texture difference but i think the almond flour only enhanced the overall flavor-i was only able to find a granulated erythritol & was too lazy to vitamix it into powdered form-next time i will do that i see what, if any, the difference migjt be-thanks so very much for sharing this delicious recipe! You are so welcome! I’m very glad that your family enjoyed them 🙂 Honestly, I’m not sure if there is a big difference with the granulated VS powdered erythritol, but since the powdered is what I used, that’s what I listed. I know some people also sub xylitol, but since we have pets, we avoid it (it’s deadly to dogs.) Happy grain-free baking! Thank you… it wasn’t really “my” recipe, I just adapted it to suit the Wheat Belly lifestyle, but I am very happy that so many people are finding it to be a useful recipe! We seldom have a desire for sweets anymore, but I DO get those cravings for dark chocolate, and the cookie is a handy vehicle, hehe. Tried the cookies this week–they were fantastic! They were crumbly like a lot of gluten free baked goods–what effect do you think an egg would have in the recipe? I’m glad you enjoyed them 🙂 I found that they were mostly crumbly when they first came out of the oven, but when they cooled, they have more of a nutty consistency. There are recipes out there that include egg, you sure could give it a try! I made them again last night with one added egg and a little extra almond flour to absorb the extra moisture. They were just as tasty and held together much better. This recipe is a keeper! Thank you for letting me know it turned out to add an egg! I may do that next time just to see what the difference is. So glad you are enjoying the recipe, it’s such a nice treat. Mine looked nothing like yours! They were much more coarse & crumbly. Even after extended cooling, they crumbled to bits. I don’ t know if the expense is worth trying again. Hi Julie, I’m sure sorry to hear that the cookies didn’t hold together for you. I know that the type of flour can make a difference in some recipes, as each brand seems to have a slightly different grind. Some are more coarse and some are more fine. The brand I have been using is Nuts.com, which is on the finer side. I’ll edit the post to reflect the brand in case it makes a difference. Another poster here added an egg to their mix, and said that it worked well to firm up the cookie more. I will do that as well next time I make them, to see the difference. I know the ingredients are expensive, but I hope that if you do try again, you have much better results! I have made these a few times now and find they come together perfectly with 2 eggs. 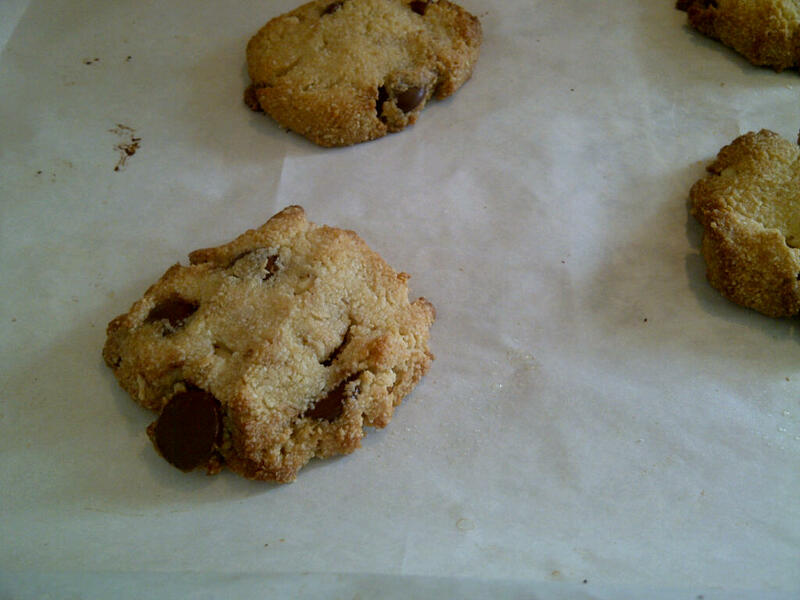 I also add one tsp of almond extract – these are totally yummy! Can’t keep them in the freezer very long — they disappear. I have started using Swerve as the sweetener and I do like it. Free shipping from the company directly. I bought some Swerve recently too. I do like it, but find that it affects my taste for a while after consuming it… other things taste sweeter than they actually are, which is a little weird, ha. I made these for work over the holidays, they were excellent and everyone love love loved them! Thank you, Gretchen, for helping us all, and me especially, to make this transition a little easier. You are so welcome Linda! I’m glad that the cookies were a success at work. It’s so gratifying to me when I can make food that is healthy for my family, and even people who do not follow our way of eating, still enjoy it. Gretchen, your Cookies are a BIG HIT! My teenage son, daughter, son-in-law, hubby, a friend and myself are now HUGE fans. The Xylitol substitution worked well. Will be serving them regularly. Many thanks. I’m so glad to know your family can enjoy these 🙂 I like how simple they are and I’m sure the xylitol worked great. Always welcome, nice to see you! I used splenda and normal bittersweet chocolate chips (what I had on hand) and while they did come out crumbly…they came out pretty tasty but crumbly. The 2nd half I added an egg and they seem to hold together better (I haven’t tasted any from that half. My kids loved them! Hopefully I can get some alternate sugar substitutes soon for more of my baking! Made these last night and while they didn’t turn out too pretty, they still tasted great! My texture was really off and they were really crumbly, too. I think one of my problems was because I used granulated erythritol (was too excited by the thought of a chocolate chip cookie after so long!) and didn’t powder it. I think next time I’ll add the egg as I saw others comment that they did. Thanks for the great recipe! Will attempt again with my two changes in a few weeks! Oh, instead of using chocolate chips, I significantly lowered the carb count by chopping up a stevia sweetened dark chocolate bar! The whole bar had only 2 net carbs and with the 30 net carbs in the almond meal, my cookies came in at about 2 net carbs per cookie! Thank you, thank you for this simple, wonderful recipe! This looks so good!. I love chocolate chip cookies!.